Sept. 12, 2012, 10:04 a.m. Journalism students are best served when they actually produce serious, real-world work, the former Washington Post editor argues. But many journalism schools aren’t set up for that. By Leonard Downie Jr. Sept. 12, 2012, 10:04 a.m.
We asked an array of people — hiring editors, recent graduates, professors, technologists, deans — to evaluate the job j-schools are doing and to offer ideas for how they might improve. Over the coming days, we’ll be sharing their thoughts with you. Here Len Downie, the former editor of The Washington Post and current Arizona State journalism professor, argues that the teaching hospital model should be brought to journalism schools. When the Nieman Journalism Lab asked for my thoughts at the beginning of another academic year, I realized how my career has been book-ended by meaningful experiences in journalism education. At the Ohio State University School of Journalism in the early 1960s, we learned primarily by producing, under the supervision of ambitious professional journalists on the school’s faculty, a large-circulation daily newspaper that covered the campus and relevant news in the city and state around us. It made a summer internship on a metropolitan daily a familiar next step. Journalism schools that have not really changed over the decades are not only jeopardizing their own futures. They are failing in their obligations to their students, their communities, and journalism itself. Now, after 44 years as an editor and reporter at The Washington Post, I’m starting my fourth year on the faculty of Arizona State University’s innovative Walter Cronkite School of Journalism and Mass Communication, where it’s my turn to help today’s students do professional-level journalism. Cronkite is one of a growing — but still too small — number of journalism schools around the country producing vitally needed journalism for their communities, states, and the nation, while also teaching, researching, and experimenting with mass communications in the digital age. Students working in the Phoenix and Washington, D.C. bureaus of the Cronkite News Service cover government and public affairs for newspapers, television stations, and websites throughout Arizona. Students at Cronkite NewsWatch report and produce nightly half-hour local newscasts on the state’s largest public television station. Cronkite students worked with others from 10 universities across the country on this year’s Carnegie-Knight News21 national investigative reporting project on voting rights. Their stories and multimedia have been published by a number of newspapers and news websites, including The Washington Post, NBCNews.com, the Center for Public Integrity, The Philadelphia Inquirer, Arizona Republic, and nonprofit news site members of the Investigative News Network. The Cronkite School is not alone. The student-staffed Capital News Service of the University of Maryland’s Merrill College of Journalism has provided news from College Park, Annapolis and Washington for that state’s newspapers and television stations. Students at Northwestern’s Medill News Service have produced journalism for local and national news media from bureaus in Chicago and Washington. Missouri’s journalism school has produced a local newspaper for the city of Columbia, staffed by faculty and students, for more than a century. Temple, Columbia, CUNY, NYU, Illinois, Columbia College in Chicago, Michigan State, UC-Berkeley, USC, and Texas have experimented with city and neighborhood news sites staffed by their journalism students. American, Columbia, Boston University, Northeastern, Wisconsin, and Iowa have enabled students and faculty to do investigative work for a variety of news media partners. Advocates of university-produced journalism compare it to medical schools placing their students in teaching hospitals. Experienced (often prize-winning) journalists on the faculties of these journalism schools give their students rigorous, realistic experiences in professional journalism, multimedia innovation, and media entrepreneurship. The students can get a leg up on competition for jobs when they graduate. Future employers of the best students can use their help in coping with the changing news media environment. The schools’ news media partners can share in journalism that downsized newsrooms can no longer produce on their own. Their audiences, including communities around universities, can benefit from more journalism that matters to them. After researching and writing for several years now about the future of news, I believe journalism schools have the opportunity and obligation to play important roles in the reconstruction of American journalism. But, to do so, their missions and curricula must change. They should produce journalism, invigorate essential standards and values, and incubate innovation. Faculty hiring and retention should be based at least as much on professional journalism talent, experience, and creativity as on academic degrees and publications. Research should be applicable to the survival and innovation of good journalism in a digital world. Students should be challenged to work on journalism for professional news media, in addition to student media. The Ohio State Lantern newspaper of my day served its student journalists and its community of readers well. But that was a half century ago. Journalism schools that have not really changed over the decades are not only jeopardizing their own futures. They are failing in their obligations to their students, their communities, and journalism itself. 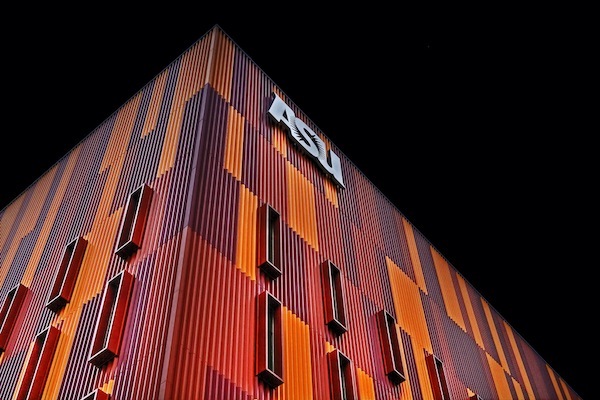 Photo illustration of Arizona State’s Walter Cronkite School of Journalism and Mass Communication by Michael Ruiz used under a Creative Commons license. POSTED Sept. 12, 2012, 10:04 a.m.
Downie Jr., Leonard. "Len Downie: The teaching hospital model works, but it will require drastic change." Nieman Journalism Lab. Nieman Foundation for Journalism at Harvard, 12 Sep. 2012. Web. 23 Apr. 2019. Downie Jr., Leonard. "Len Downie: The teaching hospital model works, but it will require drastic change." Nieman Journalism Lab. Last modified September 12, 2012. Accessed April 23, 2019. https://www.niemanlab.org/2012/09/len-downie-the-teaching-hospital-model-works-but-it-will-require-drastic-change/. | last = Downie Jr.